A bob haircut looks quite good on any kind of hair. However, this is an excellent haircut for hair which is lacking volume. Thin, fine hair, when cut having the short-stacked bob haircut looks voluminous and stylish. The Inverted Bob Haircuts look entirely great on wavy hair. The bob haircuts can be accomplished on the blunt bob, however, to gel this style using the recent trends you can test for an inverted stacked bob haircut, and go with a few stylish bangs. Along with few hair color streaks, you may make these haircut and designs look even more unique. For somebody who has the curly hair or smooth, silky hair, an extended layered bob looks tremendously good. This is especially true for the ladies who have the square or round face. Choose the layered haircut as an inverted bob that also leaves your shoulders and neck free. If you want to sport a rather edgy, punk look, then choose to set your bangs aside. Even along with some layered bob hairstyles, you really do not have to worry about styling hair. Instead, opt to allow them too obviously for a fresh look. To know better, you can research about the bob cut too. If you are actually feeling up to the groove, this red bob stylish haircut is excellent for you. The hair will make you look unique. This haircut is one of the top-notch and beautiful haircuts, which provide an elegant look as well. Make a side part of the hair and color your hair with the reddish shade. This short-colored hair will surely look beautiful on you. The hairstyle is perfect for the round and square face. One can try this haircut with any western outfit. Are you opting for the special and unique haircut to look gorgeous amongst your friends? Then you can go for the Shaggy Inverted Bob with contemporary appeal. All you need to do is make sure that the layers of the strands are properly stacked and tousled for a shaggy feel. Always make sure that the ends of this haircut are chopped and shaggy. Accomplish this inverted bob haircut and look like a star. You can try this hairstyle with any modern and western dress for the party or any formal event as well. This specific hairstyle is again another Collarbone Bob inspiration for you. Get set to look absolutely super trendy only by sporting a Collarbone Bob with Bangs. Make a side part of the hair and color your stand in a little different and special way. You have to make sure that the soft and shiny stands are provided all around the bob and then pair with the cute front bangs over the forehead as well. Try to glam your entire look only wearing this stunning haircut and then flaunt your smartness as well. Bob is one of the simplest but absolutely gorgeous hairstyles that always some girls want to wear. So, if you have a blonde and short hair, go for this Blonde Wavy Bob cut as well. Try to give yourself an absolutely perfect look along with the wavy bob. Naturally enhance the tousled waves and side apart from the strand so that the hair can dance along. It is an actual classy and elegant cut that looks absolutely gorgeous on you as well. The Sun Kissed Inverted Bob is the outstanding and classy combination, which one could wear it very easily. Create the sassy and brazen look for yourself with the inverted blonde bob. Make sure to generate casual-looking layers all over the head and then just fill it up with the cool shade of brown and white blonde. This style is quite simple to gain, and it looks stylish on any face shapes for sure. You can try this style with any modern attire as well. Get an absolute contemporary and sassy look along with an Inverted Bob with Waves. Try to fill the stand along with some layers and add the waves to up the style factor. The entire hairstyle comes with the inverted shape. The back layers are small and chopped, and the side layers of the head are little lengthier than back layers. If you have a short blonde hair, trying this one can be perfect for you too. It gives you a stunning charm and appeal, and you can wear it with any attire. Are you opting for the simple yet scintillating style for your short black hair? Then go for this Long Black Bob hairstyle without any trouble. This haircut also comes with the inverted shape where the side layers are little lengthier rather than the back layers as well. See that your hair is actually cropped shorter and also closer towards the neck to get the iconic rounded shape. You can easily go for the black hue all-around. These layers also add the glamour to any style. Get the perfectly finished appearance only by going for the straight, sleek bob along with the side-swept bangs. Straighten your hair for the sleek appeal and then give this with side-swept bangs, which cover one half of your forehead. This gorgeous short Bob with Fine Hair will surely work best for any face shapes. You can also sport this style with any kind of contemporary outfit as well. The straight and shiny looks also provide the gorgeousness and beauty in your personality. If you are confused about picking the single color for your hair, then instantly put the dilemma away and directly go for the dual-toned pixie bob. Trying the Funky Two-Toned Bob, you will be able to flaunt your personality in minutes as well. First, try to make the front layers colored in the red shade and then dye the rest of your hair with black shade. This particular look helps you to look entirely smart, stunning and gorgeous as well. 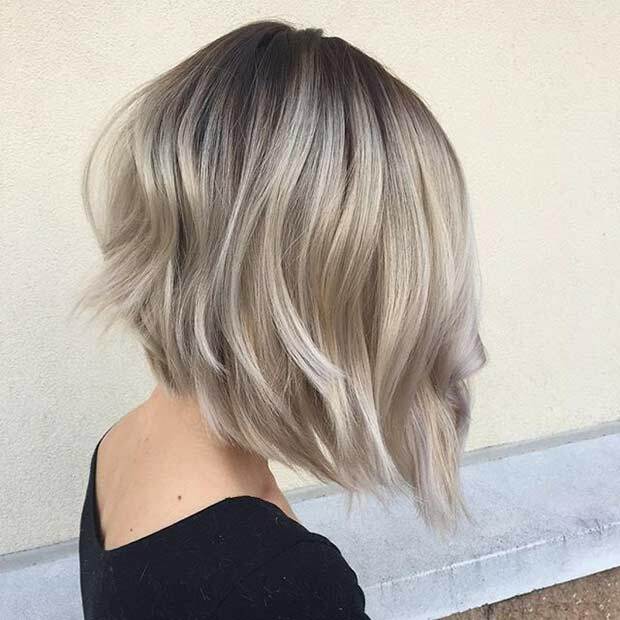 Each and every woman out there wants to look quite gorgeous with their special haircut, and the mixed blonde bob is the ideal style to achieve it. When it comes to choosing the right kind of bob cut, all you require is to select the one that looks gorgeous on you. The inverted bob cut is quite trendy and fashionable on a girl. You can also add the waves to the back layers. The hairstyle looks absolutely classy to sport for any formal or casual party and event as well. Do you have a short and blonde hair? Then to stylize your hair without any hassle, you should try the Edgy Inverted Bob. In this hairstyle, you have to do the middle part, and the front layers are little longer than the backside chopped layers as well. The soft and mellow ends of the strands are highlighted and textured with the blonde cream color. Be the fashion icon by wearing this classy and cute short edgy bob. A considerable number of people are there that opts for the little messy and uneven look, and that is why they choose the Inverted Choppy Bob as well. Try to gather the rather eye-pleasing look with an Inverted Choppy Bob. In this particular haircut, you will have a side parting, and the provided textured and creamy finish will give you the ultimate soft and shiny look as well. If you want to accomplish the trendiest look and standout in the crowd this style is an ideal option to wear to any event or party. It will provide you a fashionable and elegant look too. Walk with confidence in a Bob with Highlights. Bob is quite an in-trend hairstyle, which offers a girl to experiment various styles with it. And apart from others, trying the bob cut with the texture or highlights in the edges will give a bold, beautiful and ravishing look as well. Let there be crisp edges and the nice angle for the bob cut layers. Make sure to go for the natural color or little golden so that the focus lies on the haircut promptly. 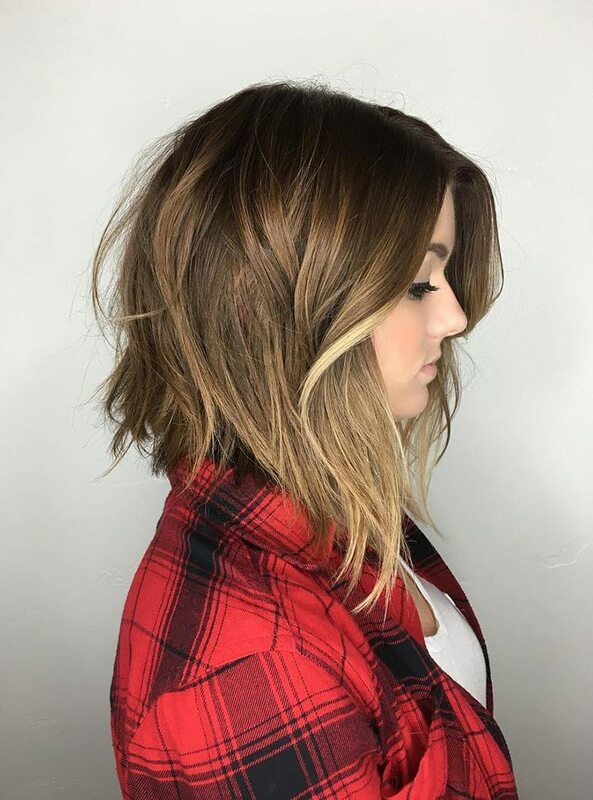 Amongst all of the bob cut hairstyles, this one is little unique and charming too. 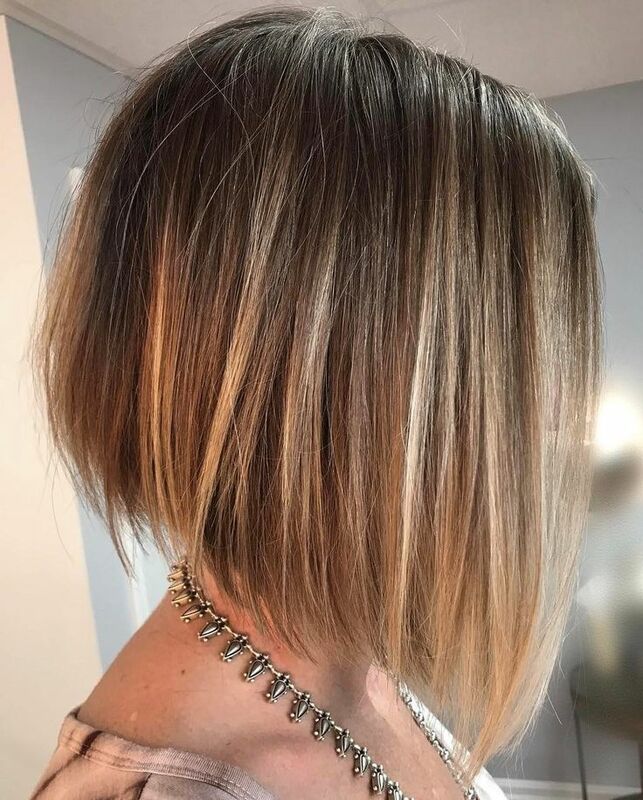 In this Back View of Inverted Bob cut, you have to make the back-side hair little faded with razors and then add the creamy and soft colors to the hair as well. It is believed that the layers always add glamour to any hairstyle, so glam your short black bob with it and understand it. Short haircuts are fun but choosing medium length bob will also be perfect for you as well. Bobs are the trendy styles amongst girls. And in this Medium Length Bob, it comes with the soft, smooth and silky haircut and color and helps you to look bold and smart as well. This hairstyle is perfect for any kind of party or event, and it is best for the round shaped face.